I've noticed the same thing. The same relics over and over, while others never appear. Didn't know it was so widespread. I got multiple Nadiel Staffs as well and that's probably the worst diamond relic, so it's disappointing. My teammate got 5 of them. This doesn't seem to match previous results. It's also pretty unfair when "10 - 200" is advertised. Were the chances decreased or was this extremely rare, horrible luck? It's Legendary cells, not R or E cells. 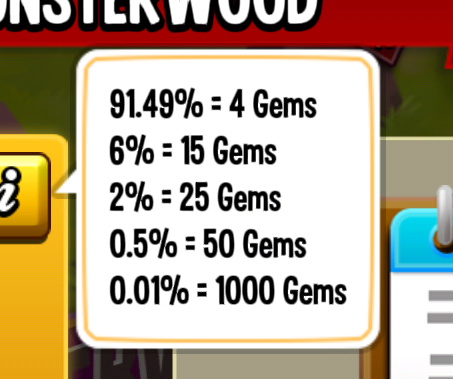 Epic and rare cells aren't even given out in Monsterwood. Neither were level 1 or 2 runes during this period. Please check the first list in my post. There were also more resources given out since I made this thread. If you like this better because it means you can watch less ads, that's fine, but it's not right to force a small group of people to be left out of a large part of the game. That's why the people they choose to test it should be allowed to opt-out, which would be perfectly fair. Secondly, the reason complaints like this are brought up is because we enjoy playing the game and want to see it succeed. When something bad happens, it doesn't help anyone to keep valid complaints silent just because it's the company's right. Luckily, after over two weeks and thousands of resources lost, the gem roulette is finally out of my game. @tom13 I think the gem roulette is fine if everyone in the game has it at the same time. But it's not fair to force people to test it while everyone else is getting tons of resources and even more gems. @grnxnham I hope it ends soon and before the next round of cells. I already missed out on so many from two weeks ago. The gems were the worst though. We're given gems as our reward, but then everyone else starts getting a lot more gems than us on top of what we've already lost out on. If you haven't been randomly selected for the gem roulette yet, I'll explain why it's extremely unfair and will make you lose a ton of resources. For those who don't know, the gem roulette is being tested by Socialpoint and players are randomly selected to test it for them. It completely replaces Monsterwood, so you will not get the normal Monsterwood rewards that everyone else gets, which is extremely unfair. It even removes other parts of the game, which I will explain below. There is no way to opt-out and support will not do anything about it either. Every day when the daily goals change over you get to spin the roulette by watching an ad. You only get two per day, one right away and one a half hour later. For each of these spins, you get up to two extra chances to watch another ad and respin if you don't like what it lands on. You almost always get only 4 gems per spin since it has a 91.49% chance. All resources given out by Monsterwood including cells, relics, gems, etc. Since receiving the gem roulette I've missed out on 240 cells that I could have used to rank monsters for battlegrounds and the library. I also missed the round of relics that ended yesterday. Another 120 relics I could have used to rank my existing ones, or the chance to get a gold one. The food that was given out over the weekend (this is the one resource I personally don't mind missing). The worst one yet: Today, normal Monstwerwood is giving out gems. This means everyone in the game will be getting 40 gems per day, while players stuck with the roulette only get 8. Ability to speed up farms growing food. This is one of the surprising changes, it apparently affects literally anything that has an ad. When the race started I went to speed up a farm to collect food for a food task, but had to use a gem because this is turned off. Last week's speed-up event for hatching and breeding by watching ads. Just like the farms, it didn't allow me to participate in this event. I have been stuck with the roulette for over a week now, and now that I'm losing gems, the one resource it actually provides, I'm desperate to get it out of my game. It's not fair to force certain players to use this. I wouldn't mind if everyone tested it together, but what's happening is that some people are losing out on a lot of resources and even missing events in the game because of it. The lost resources alone aren't worth 8 gems a day, or even the extra you might get when you're lucky. Now it's even gems on top of all of that. Perhaps some people might prefer to watch fewer ads, but there should be a way to opt-out instead of unfairly forcing it on people who don't want to miss out. Scheduled wars are not the solution. It would only add its own problems. For example, which timezone will they start in? If it's more favorable to one team, it can change the outcome of the war. Also, if a team wants to wait a little bit before starting a war, they would have to wait a full 2 days to join the next one. The game has had a serious problem with bugs for years. I've never played a more buggy game, yet they still constantly release new features and events instead of making sure the current ones are working. The amount of bugs can make the game seriously frustrating. I feel like most of my time spent on this forum has been complaining about them. Compensating with gems might be nice, but it doesn't fix how unfair the amount of bugs can make the game. Instead of focusing on doing the best you can, it turns into more about hoping to be lucky that you won't encounter one. Everyone would get the compensation, but you're still down 100 orbs, or maybe your team even lost the whole event because of it.